NotesCounter is a useful new jailbreak tweak that adds a live word count to the iOS Notes application. The handy package is available to download now on the Cydia Store free of charge, and it’s optimized for iOS 7 and ARM64-devices. Developed by Julian Weiss (@insanj), NotesCounter is a simple jailbreak tweak that makes one single change to Apple’s mobile OS. As such, no additional preferences pane is added by the package: instead, NotesCounter will begin working its magic as soon as jailbreakers download the software from the Cydia Store. 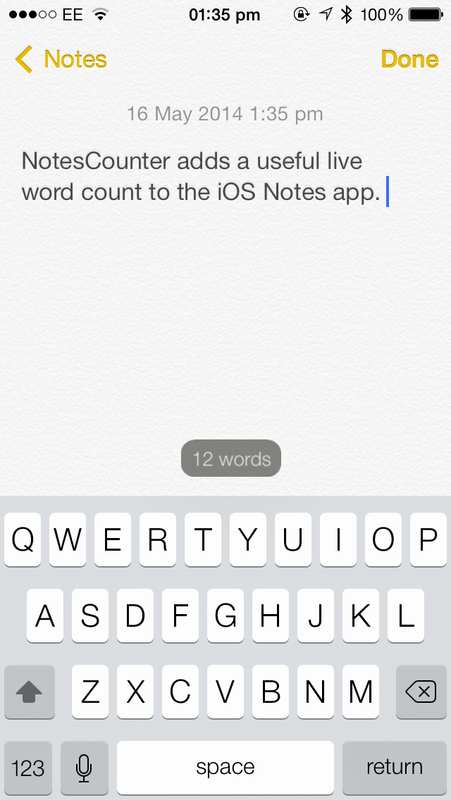 Once installed, NotesCounter indeed adds a live word count indicator to the iOS Notes app. As you can see, this appears towards the middle of the application’s interface above the iOS keyboard, and as you’d expect, it updates in real-time as users type in the app. If you often write inside the Notes app, NotesCounter will prove to be a useful addition to your iOS device. Julian Weiss has brought a series of interesting jailbreak tweaks to the Cydia Store over the last couple of months (including Edit Alarms, Edit Clocks, and Circlet), and NotesCounter is a great addition to his portfolio of jailbreak software. You can pick up NotesCounter on the Cydia Store free of charge, and as mentioned, it’s optimized for the iPhone, iPad, and iPod touch. For some of our favorite recent jailbreak tweaks, check our coverage of PopShare, Almpoum, and KeyShortcut Pro. See also: Ubisoft Updates Assassin’s Creed Pirates To Add New Area, Mission And Daily Challenges, Cydia Tweak: How To Share Text From The Copy-And-Paste Menu, and OTTTD, An ‘Over The Top’ Tower Defense Game, Is Launching For iOS On May 22.